A frequently overlooked tool in the fight against erroneous drunk driving convictions is medical evidence that is exculpatory evidence of a medical condition that could have affected the defendant's ability to properly perform field sobriety tests. Within the past two years I have had clients with viral labyrinthitis, Meniere's disease, and arthritis, who have all benefitted from the introduction of medical evidence that created a reasonable doubt in their cases. The client with viral labyrinthitis scheduled an appointment with his physician before his arrest, but canceled it when he felt better on the morning of the day of his arrest. Three days later he saw the doctor, who diagnosed him with viral labyrinthitis. The physician testified at trial that the diagnosis was consistent with every observation the officer made, including failure of all the field sobriety tests, and with the only one exception, the odor of an alcohol beverage. The clincher was the doctor's testimony that she confirmed her diagnosis by testing for and detecting residual horizontal gaze nystagmus during the examination. It is possible to introduce medical evidence without calling the medical provider as a witness, and thereby saving the client the expense of paying a doctor to come to court. (11) Certified Records of Regularly Conducted Business Activity. The original or a duplicate of a record of regularly conducted business activity, within the scope of Rule 5_803(b)(6), which the custodian or another qualified individual certifies (A) was made, at or near the time of the occurrence of the matters set forth, by (or from information transmitted by) a person with knowledge of those matters, (B) is made and kept in the course of the regularly conducted business activity, and (C) was made and kept by the regularly conducted business activity as a regular practice, unless the sources of information or the method or circumstances of preparation indicate lack of trustworthiness; but a record so certified is not self_authenticating under this subsection unless the proponent makes an intention to offer it known to the adverse party and makes it available for inspection sufficiently in advance of its offer in evidence to provide the adverse party with a fair opportunity to challenge it. This provision, which does not have a counterpart in the Federal Rules of Evidence, contains the necessary foundation for the business records exception to hearsay contained in Maryland Rule 5-803(b)(6). Under Rule 5-902(a)(11), it is necessary to have the medical records custodian complete a certificate that complies with this provision and send it to the State, along with the medical records, in advance of trial. 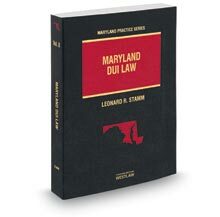 The certificate should also comply with Maryland Rule 5-902(b), which defines "certificate" as "a written declaration under oath subject to the penalty of perjury." The certificate should be prepared and sent to the custodian for signing along with the subpoena for the records and a medical release signed by the client. In a recent case, the defendant produced medical records from 1987 up until 10 days before the arrest in June 1998, documenting a history of problems with his right ankle which "could limit his ability to walk in a straight line" diagnosed as "post traumatic degenerative arthritic process" and problems of balance resulting from gout arthritis in the left foot marked by swelling with severe pain. This evidence can be a powerful negation of the State's evidence concerning poor performance on field sobriety tests and other observation evidence offered to show impairment of normal coordination. These records are self authenticating under Rule 5-902(a)(11) and are often received in evidence without an objection. It is important to carefully interview every new client as to diagnosed and potential medical problems that may be relevant to the case. If the client is still undiagnosed after the arrest, they should be instructed to obtain an examination as soon as possible. The records of the examination, with the proper certificate, may be admissible. This is especially true in accident cases, where the defendant frequently underestimates the existence of or extent of injury. In a recent case, a defendant received a diagnosis of a concussion shortly after an accident that resulted in arrest. This evidence should help to show that the accident likely caused the apparent impairment of normal coordination that was observed by the arresting officer. Many clients have health problems that can constitute exculpatory evidence in a drunk driving case. It often does not occur to the client that the particular medical condition constitutes a defense, especially if they believe themselves to be guilty. Nevertheless, when it is possible to present such a defense without the defendant testifying, that belief is irrelevant.